Michael West (left) works with Joe Robinson of the Pennsylvania society to put together West's first real resume. West spent 14 years in prison. He was released on May 3. A dog-eared piece of paper held one of the keys to the rest of Michael West's life. It was a sample resumé, and West's goal that recent day was to build his own, his first, filling it top to bottom with enough skills and accomplishments to persuade a prospective employer to hire him. For a 39-year-old man who walked out of prison on May 3 after doing 14 years for third-degree murder, it would be a challenge — but not one he'd have to face alone. West sat across a table from Joe Robinson, his lifeline, in a rundown church office framed by tarnished stained-glass windows. 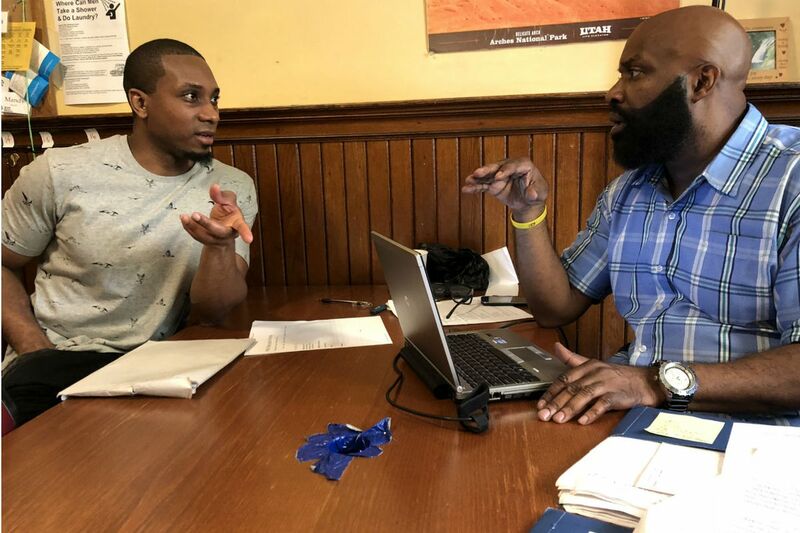 Over the last three years, as head of the Pennsylvania Prison Society's mentoring program, Robinson has met with hundreds of ex-offenders whose crimes skewed sharply to the violent, and helped usher them into a job marketplace with ever more to offer, though not so readily to them. "Most of the time, if the guy can stay busy," Robinson said, "he won't be a problem." And a big "if" that is. Nationally, unemployment stands at 3.8 percent; for African Americans, it is 5.9 percent, the lowest since the government started keeping track of that data in 1972. But across the country, between 60 percent and 75 percent of former convicts remain jobless a year after their release, according to the National Employment Law Project. Recently, though, as the economy has picked up steam, Robinson has noticed small, encouraging changes. "I think more and more people are giving them a chance," he said. "There are more jobs that other people don't want to do, and it creates opportunities." For West, opportunity began with a blank page on which Robinson wrote his name top and center, followed by contact information. He had moved in with his mother in West Philadelphia. And his phone number? West rubbed his forehead. "Jeez," he said. "267, uh …"
Robinson chuckled. "Still got to get used to it, huh?" "All this stuff is new to me," West said. The Mayor's Office of Reintegration Services, known as RISE, is tasked with supporting the 25,000 people released from Philadelphia prisons each year. It provides help with jobs and housing primarily for ex-offenders whose crimes are not of the highest order. For the worst, there is Joe Robinson. In 2015, he joined the Pennsylvania Prison Society, a nonprofit that advocates for prisoners, the formerly incarcerated and their families, with roots going back to 1787 and the Philadelphia Society for Alleviating the Miseries of Public Prisons. In smoothing the transition from cell to free society, it often teams with such groups as the Broad Street Ministry, which maintains a "style pile" of clothing suitable for job-seekers. At 52, Robinson is a mentor with quite a resumé of his own — an ex-offender who bettered himself by earning a degree at Community College of Philadelphia, and who is two semesters away from a bachelor's in social work from Temple University. He sees a couple of clients a week, but on two nights, he also visits the State Correctional Institutions at Graterford and Chester, where he tries to point inmates toward their new lives before they reenter the community. No sooner are they released than the process of finding housing and employment begins. They must pass a drug test, and provide an original Social Security card and a state ID. Robinson estimates that about 60 percent of those he counsels find full-time jobs, usually in small businesses. "Most of the guys we're trying to help do pretty good," he said. "They just need that one chance." Next up on Michael West's resumé: a blank space for 'Objective." Reaching into a dark blue folder, Robinson told him, "I have something to go under 'Objective' already. Let's see if you want to use it." He pulled out a resumé from a previous mentee. "Here we go. It says, 'To obtain employment in a positive work environment, and to be a team member with other members of my place of employment … Willing to learn any and all skills necessary to bring success to my employer.' "
Joe Robinson holding a sample resume. The name and identifying information was redacted to protect the person's privacy. "Do you like that?" Robinson asked. "If not, we can go with something else." "Yeah, yeah," West said. "I like that." And what about those skills? "So, you're talking about, um, everything that I did? As far as in prison?" "No," Robinson responded. He wanted both, prison jobs and those on the outside. "I worked in a supermarket" sweeping and mopping floors, he said. "And I'd put the returns back on the shelf when people used to leave them at the cash register. And then I got promoted to produce." He also worked at Philadelphia International Airport handling luggage, and even took a flying lesson. In prison, "I sewed sleeves on T-shirts," he said, and "I did basic plumbing." "See, you got skills here," Robinson said. "OK, instead of using 'Department of Corrections' [as a previous employer], we're going to use the 'Commonwealth of Pennsylvania.' Makes it sound a little better." Oh, and the prison commissary — West had worked there, too, for a year. "I learned customer service skills, how to do inventory, how to load and unload the trucks." Robinson surprised himself. "Dang, you actually have a full page. You have a lot of work history." The Philadelphia Inquirer, Thursday, Nov. 11, 2004. On Nov. 11, 2004, the Inquirer reported the arrest of a Philadelphia man who allegedly played a key role in the murder of a 20-year-old drug dealer in Darby Borough. Michael West and a friend had met the dealer for a sale, only to kidnap him and stuff him into a Ford Taurus. After stopping at a stash house to steal the dealer's supply, they turned down a dark street, pulled him out of the car, and threw him to the ground. As he lay on the sidewalk begging for his life, he was shot five times with a 9mm handgun. West and his friend accused each other of pulling the trigger. But before he could be tried, West pleaded guilty to third-degree murder, among other charges, and spent his prime years incarcerated, for the most part at SCI Dallas in Luzerne County. Fourteen years later, Robinson was sizing up West for a button-up shirt, khaki pants, and a pair of shoes from the Broad Street Ministry's style pile. West would soon meet with another counselor who'd pick out some possible jobs and send him out, armed with his new resumé. "I'd work at a fast food place, shipping, overnight stop, janitorial. Really, anything," he said. "I'm trying to get to the labor union, and maybe one day get into real estate. But right now, I just want to be in my daughter's life. She's 17, man." A wide smile crossed his face. "College and that coming up. She's graduating next year. She's going to her prom." Asked if he had paid his debt to society, he replied he didn't think he had. Not yet. "At one time, I took from the community, so I'd like to give back," he said. "Yeah, I think that's officially when my debt is paid."